One of Chris’s short stories, Planetstrider, is featured in a new science fiction anthology, Galatic Frontiers. Planetstrider is the prequel to the newly released Ganog Wars series. Galactic Frontiers is a collection of space opera and military science fiction stories by 16 different authors. Check out the details below! Sixteen talented authors. Sixteen remarkable stories. One blockbuster space opera collection. 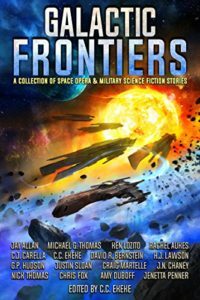 Welcome to Galactic Frontiers, an epic anthology of space opera and military science fiction stories! From the far reaches of space to the interiors of the human soul. Journey to dystopian futures where humanity fights for survival beyond Earth against overwhelming alien forces. Travel to the galactic fringe where you either kill and get paid or die and stay broke. Experience the ethereal wonders and tragic consequences of godhood. Discover the awe of outer space and coming face to face with the unknown. Featuring contributions ranging from bestselling authors to up and coming writers, the stories in Galactic Frontiers will exhilarate and captivate, taking you to new universes and beyond! “Tombstone” by Jay Allan. First published in 2012. ← Behind the Lines (Ganog Wars Book 1) Released on Amazon!